The classic game of blackjack has been around in casinos in the United States for decades, and now you can play the same great gambling game online. If you are looking for top online blackjack, real money games can be played at a wide range of legit USA casino rooms in 2019. Just deposit with your credit or debit card and get playing in minutes. 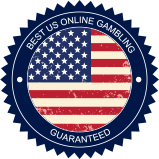 Not all online blackjack sites are the same, however, so make sure you find only the best rooms by checking out our reviews on these pages. Who knows? You may even discover some exciting new variations that you won't see in your local brick 'n' mortar joint. The basic format of the betting card game plays the same on the net as it does in a live casino. Each player is dealt two cards face up and the dealer a card up and one down. The object is to keep drawing cards (hit) to get as close as possible to 21 as possible. If you beat the dealer's total you win. Bets are placed before the game starts and if you are dealt a blackjack (an Ace and a picture card) you win automatically, 3:2 your money. Games vary but generally the dealer will have to hit on 16. Some games offer 'insurance'. That means you can bet extra in the event the dealer is dealt blackjack (although, generally speaking, it's inadvisable to take out insurance). Players can also double down at any point, which involves doubling your bet on receipt of just one more card. This is a good bet to do if you are dealt 11 and are looking for a picture card to take you up to 21. Obviously, if you live miles from a brick 'n' mortar casino, getting your blackjack fix can be hard. That is why online blackjack real money games are so great. You don't need to drive for hours. Just turn on the PC and start playing. There is also no wait for a seat to open. When you play real blackjack online you can get gambling straight away whenever you are ready. Online blackjack real money stakes can oftentimes be lower than the ones you will find in a land-based casino too. Where a big Vegas casino may have limits starting at $5 or higher, online blackjack sites will sometimes start at mere cents. The great thing about blackjack gambling on the web is that you can find interesting variants you won't see in a live casino. So what kind of games will you find at the good real cash websites? European Blackjack allows players to "re-split" cards that have already been split. Multihand, or ThreeHand, blackjack lets you play up to three hands at the same time. It means more gambling, more action and more chances to win cash. Some gaming sites will even offer 5 Hand Blackjack which gives you 5x the chance to win. It's a great game to play against the dealer. Super 21, or Super Fun Blackjack, is an action-filled online blackjack variation which lets the player win automatically if their hand has six cards or more with a total of 20. What is great is that this rule comes into force even if the dealer hits a blackjack. Other benefits of Super 21 are that you can split cards four times and a player's blackjack is better than the dealer's. Finally, another popular online blackjack real money variant is Blackjack Surrender, which lets you "surrender" half your bet if the dealer's up card is a 10, J, Q, K or A in order to get the other half back. Another good benefit of online blackjack is that the games oftentimes qualify toward juicy welcome deposit match bonuses. When you first make a real cash deposit at a legit USA site, you can activate a special bonus by entering a promo code. Play real blackjack online and over a month or two you can qualify for hundreds, or even thousands, of cash back from the casino. That's a deal you won't get in a live casino.